Specializing in marine solar power generation for sailboats, trawlers, yachts, houseboats,ferries, navigation aids ​and specialty marine applications. Complimentary solar system design consulting. Having plenty of electric power on board while cruising can make the difference between a fantastic experience and a marginal one. We know; we are cruising sailors. ​If you are considering solar power for your boat and want to learn more about the technology, check out our overview presentation titled Selecting the Proper Solar System for Your Boat or our Cruiser's Guide to Selecting and Sizing a Solar Charging System under our Support, Manuals & Info section. Marine solar panels are an excellent source of electrical power for the cruising sailboat or power boat. We at Custom Marine Products have developed numerous approaches to installing marine solar systems easily and cost effectively. Our marine solar panels are custom made to our stringent specifications by leading and highly acclaimed PV solar panel manufacturers both in the USA and overseas. The solar cells in our panels are of the highest quality and output available and made by SunPower (USA), Bosch (German) and Qcell (German). You will see on our solar panel page that our new semi-flexible solar panels have comparable performance to our line of rigid high performance marine solar panels. Complete Marine Solar System Kits - Figuring out the size of solar panel you need and matching it up with the various accessories required for a complete high performance system can be a daunting task. That is why our engineers have developed easy to install complete solar system kits that contain everything you need for your marine solar system including: marine solar panels, mounting systems, solar wire and charge controllers. We offer top-of-pole solar panel mounting systems with an optional integrated outboard motor lift crane that are cost effective, easy to install and robust enough for challenging weather conditions. We also offer mounting systems for the new flexible high output marine solar panels that can be mounted on a canvas bimini or curved hard top. Our solar panel mounting systems will accommodate most commercially available solar panels. *** NEW *** Rigid and Flexible Marine Solar Panels with SunPower Cells - We have had a number of requests to offer marine solar panels with premium SunPower cells. 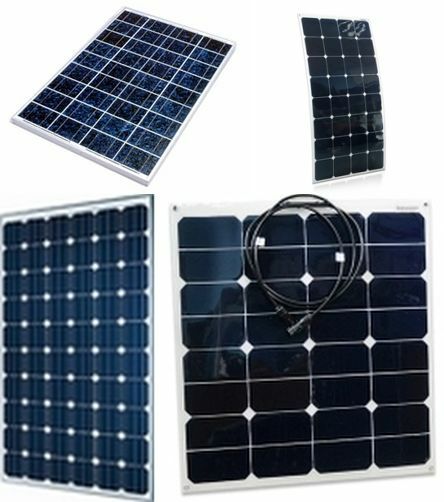 We have just released a new line of marine rigid and flexible solar panels with premium SunPower cells. These rigid panels are among the highest performers in the marine industry and are available in 100, 140, 150 and 175 watt sizes in various shapes. Other sizes are available by special order. We also have a full line of flexible solar panels with premium SunPower cells including 55, 110, 120, 130 and 145 watt units. *** NEW *** LiFePO4 Lithium based marine batteries compatible with most lead acid battery chargers are powerful drop in replacement for lead acid and AGM batteries. Now that testing has been completed and our new LiFePo4 batteries passed with flying colors, we are offering them on our website under our PRODUCTS section. We are excited to make these batteries available to our customers. They have out performed our expectations and we are offering them at a discounted price to get more out there on the water. Learn about LiFePO4 marine batteries in our product section and see how they performed during testing on our Blog. Our engineers will work with you to design a solar system specific to your needs. Visit our Gallery of Installations, our Testimonials/Customer Comments and our Blog to learn how fellow mariners have implemented solar systems on their boats. Use our Power Consumption Worksheet to determine what size solar panel is appropriate to your needs. Don't hesitate to contact us to discuss how we can assist you with your marine solar equipment needs. If you are considering solar power, Custom Marine Products can help you assemble a system specific to your needs.